So here it is. 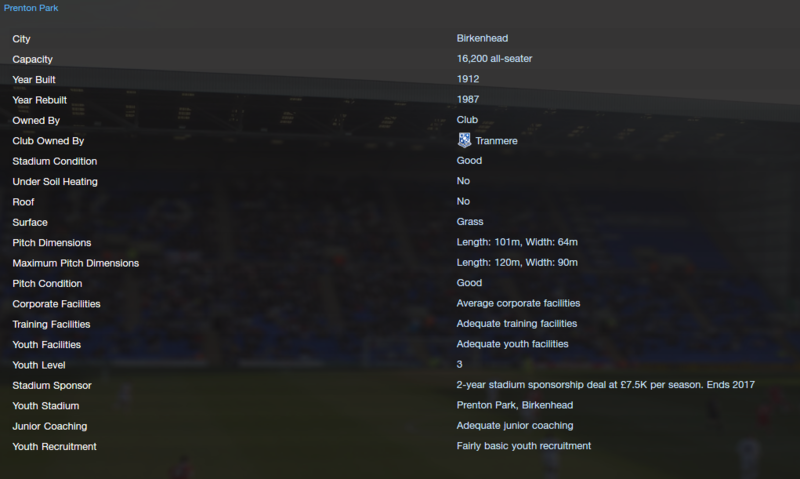 My journey into the world of football (manager). My aim in this career is to win as many trophies as I possibly can before the release of Football Manager 2017. I will be beginning my journey with my favourite team, Tranmere Rovers of the Vanarama Conference. I'm going to keep this opening post free to keep a record of my career. After being relegated from the football league last season, we are predicted to finish top of the pile in the National League. This is where I'll be aiming to finish as I want to bounce straight back up to the football league. We have a couple of local derbies this year with Wrexham, Chester and Southport which should spice things up a bit. For a national league club, Tranmere have one of the nicest grounds around (I know this from experience having visited a number of the others this year IRL). With a capacity of just over 16,000, we are in a great position for when we start climbing up the leagues. I'd expect us to average 3,000/4,000 fans this season. Facilities wise, we look ok but only that. Pretty much everything is either average or adequate. I have no idea how this compares to the other teams in the league but I'd imagine we'd be one of the best. I will definitely be looking to improve this if we can, especially the youth recruitment. 2016-03-05 19:28#227126 Miniulv : Looks good so far! Would love to see you work your way up and compete against Liverpool and Everton! You are reading "John Warrington: A Footballing Journey".